"You're going to hear more from the European leaders in the coming days about the specific proposals they're going to put in place. 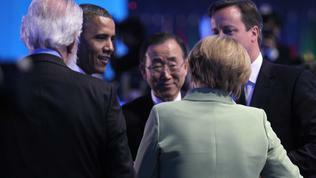 They're negotiating towards an agreement at their summit at the end of next week. [...] It's going to be really a critical summit for them." 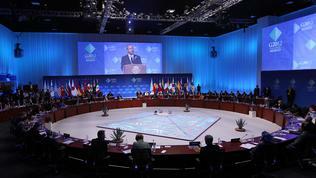 This statement raised significantly the stakes for the European Council summit on June 28-29. 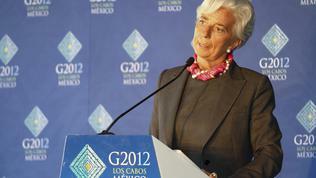 Moreover, it was delivered by US Treasury Secretary Timothy Geithner after the G20 summit in Mexico. As expected, the crisis in the euro area was a central topic of the summit and Mr Geithner was particularly quite thorough in his explanation what was to be expected from European leaders. They are trying to build a stronger set of institutions for fiscal union - banking union, as the Europeans describe it, he said, as well as to implement "in the very near term" measures to support financial systems in Europe, so to ensure that countries like Spain and Italy "can borrow at existing low interest rates," Mr Geithner explained. During the summit Italian Prime Minister Mario Monti has proposed the temporary rescue fund for the euro area to start buying out government bonds in order to reduce the interest rates of Spain and Italy. "The idea is to stabilise borrowing costs, especially for countries who are complying with their reform goals, and this should be clearly separated from the idea of a bailout," Mario Monti said at a press conference, quoted by EUobserver. The G20 declaration, published after the summit, states that eurozone leaders are committed to maintaining the integrity and stability of the monetary union, to improve the functioning of financial markets and "break the feedback loop" between sovereign debt and banks. The latest, though it does not say anything specific, hints of a possibility the bailout funds to be used to purchase government bonds and for direct bank recapitalisation, as the leaders of Italy, Spain and France insist. Eurozone leaders have allowed the temporary rescue fund EFSF to buy government bonds on the secondary markets in the last summer, but so far this has been done by the ECB which, according to The Financial Times, bought 210 billion euros of sovereign debt last year. 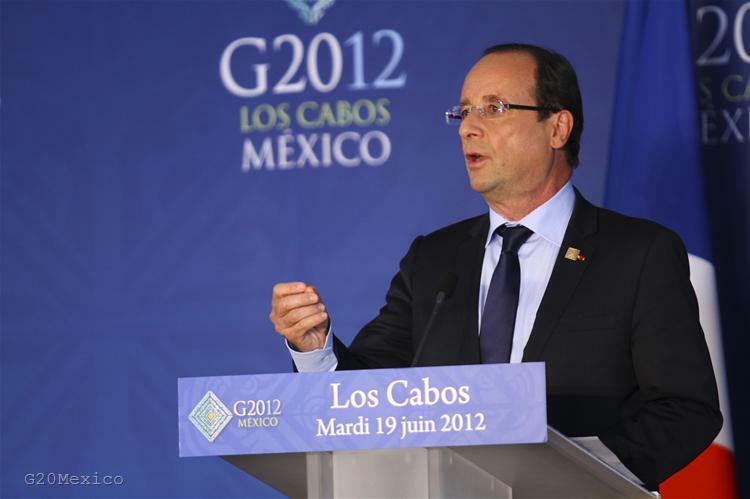 French President Francois Hollande supported the Italian prime minister: "We are looking for ways to use the European Stability Mechanism for this. At the moment it is just an idea, not a decision." According to FT sources, German Chancellor Angela Merkel opposed to the idea but she signalled she might be willing to make some concessions. The discussion is likely to continue at the meeting of the leaders of Italy, Germany, France and Spain, which will take place in Rome this Friday. US Treasury Secretary Timothy Geithner described as a key element in the European efforts to tackle the crisis "this focus on banking union or a broader financial architecture -- financial union". He said the European leaders were working to create "a framework of reforms so they can stand behind their banks, provide capital to the banks that need it, make sure they're protecting the savings of their depositors." 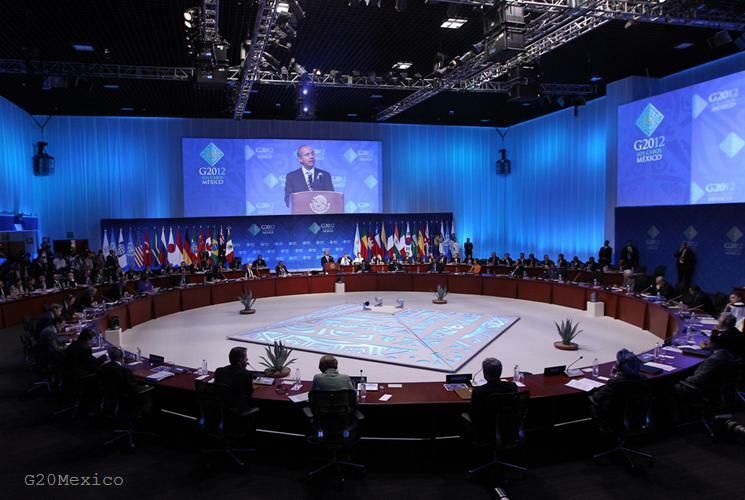 In its statement the G20 leaders supported the intention of the eurozone to take "concrete steps towards a more integrated financial architecture, encompassing banking supervision, resolution and recapitalisation, and deposit insurance." 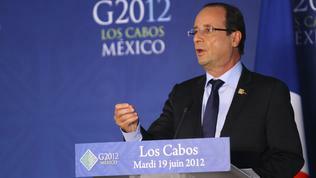 The G20 welcomed Spain’s plan to recapitalise its banking system and the eurozone`s readiness to support it financially. Another key element, again according to Timothy Geithner, is the European leaders' willingness "to work in partnership with Greece to make sure that Greece is reforming within the European community." And the third element in dealing with the crisis is economic growth, because for these reforms to work in Europe over time, Europe needs to grow faster, US Treasury Secretary said. This is very important for the US as well, because given the crisis in Europe and weakened growth outside Europe, the US is not growing as fast as needed, Mr Geithner pointed out. The exchange of remarks between the US and the EU on this topic is not new. Every time when Americans say that the European crisis hinders global economic recovery, the Europeans do not miss the opportunity to remind them that the crisis started precisely on the other side of the ocean. The G20 meeting in Mexico was no exception. At a press conference before its opening, European Commission President Jose Manuel Barroso got angry by a journalistic question why North America should pay for the European crisis (through the IMF) since the Europeans were so wealthy. "This crisis was not originated in Europe … seeing as you mention North America, this crisis originated in North America and much of our financial sector was contaminated by, how can I put it, unorthodox practises, from some sectors of the financial market. [...] Frankly, we are not here to receive lessons in terms of democracy or in terms of how to handle the economy," Mr Barroso replied. 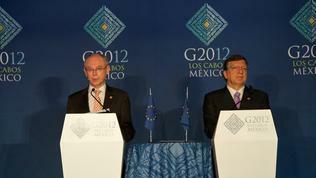 In a joint statement after the G20 summit in Mexico, the European Council president, Herman Van Rompuy, and European Commission President Jose Manuel Barroso stressed the support expressed by the G20 leaders for the EU's intention "to move ahead with deeper economic and fiscal integration", because "a strong, deeply integrated European Union is decisive for systemic global stability." EU leaders expressed their satisfaction that the Group of 20 has confirmed its commitment "to fully and speedily implement financial reform and build a more responsible and solid international financial sector." 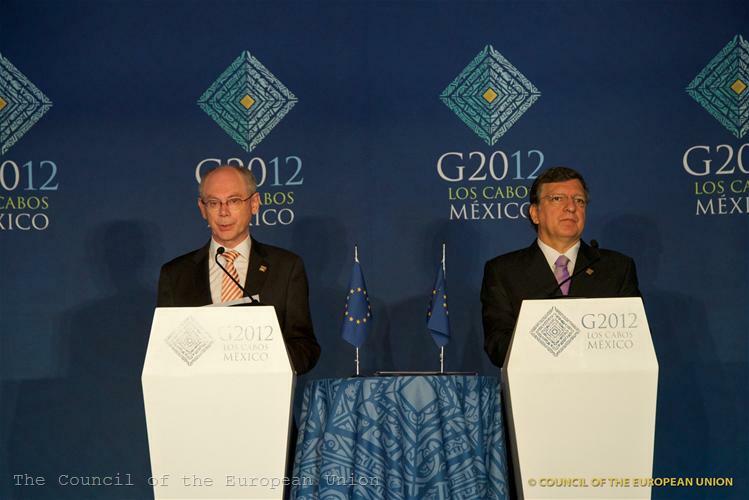 However, although yet at his arrival in Mexico Jose Manuel Barroso raised the issue of the Financial Transaction Tax, once again the G20 communique says nothing on the matter. Instead, the IMF announced that 37 countries have committed to contribute to the increase of the fund`s resources to a total of 456 billion dollars, which would double its loan capacity. 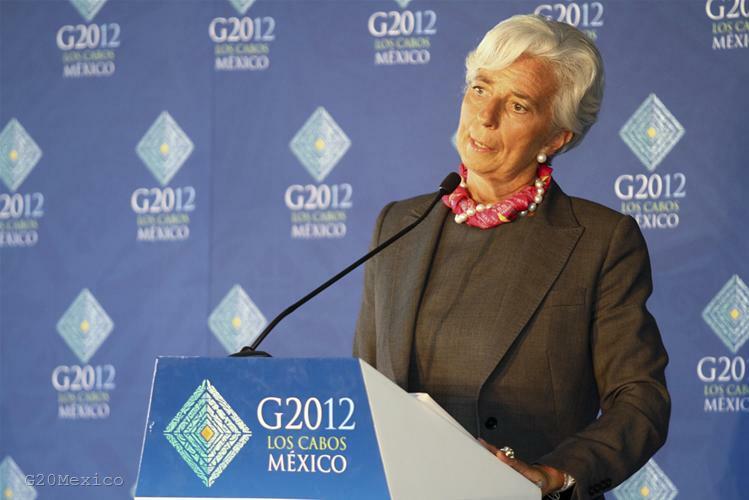 The declaration of the G20 explicitly states that the money "will be available for the whole membership of the IMF, and not earmarked for any particular region." These funds will be used only in case of need as a second line of defence and will be repaid with interest, the IMF statement states. The BRICS countries (Brazil, Russia, India, China and South Africa) have finally come up with specific numbers to increase their contributions to the IMF. 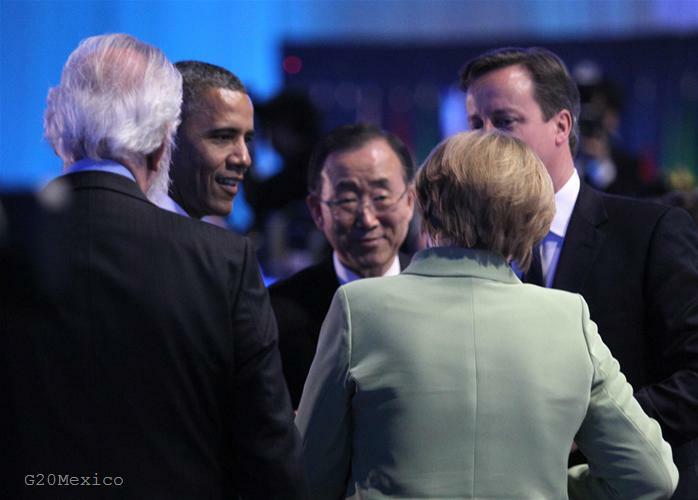 At the previous meeting of the G20 these countries pledged to participate in increasing the resources but did not quote specific amounts. According to the IMF, China will contribute 43 billion dollars, while India and Russia will increase their contributions by 10 billion dollars each. In return, the BRICS countries expect full implementation of the reforms of the quota shares and voting power in the IMF. In their final statement the G20 leaders unequivocally commit to implement the agreed reforms within the agreed deadlines.